1-OWNER! CLEAN CARFAX! $107,385 STICKER! 21 SERVICE RECORDS! WARRANTY! WE CAN DELIVER THIS MERCEDES-BENZ CL550 TO ANY DRIVEWAY IN THE COUNTRY! VISIT OUR WEBSITE AT WWW.SHOPRIGHTCHOICE.COM TO SEE 78 PHOTOS, THE FREE CARFAX, AND MORE INFO ON THIS SPECTACULAR DEAL! 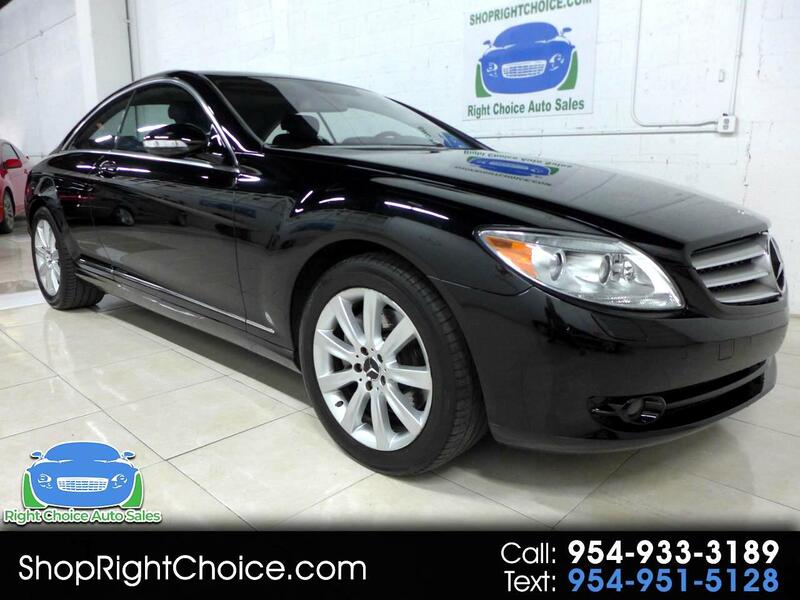 THIS 1-OWNER CL550 ONLY HAS 61K MILES, HAS A CLEAN CARFAX, HAS BEEN VERY WELL MAINTAINED WITH 21 SERVICE RECORDS, HAD AN ORIGINAL STICKER PRICE OF $107,385, AND IS PRICED $4,270 BELOW THE CARFAX VALUE TO MAKE IT THE BEST DEAL IN THE COUNTRY! DON'T MISS THIS RARE CAR. Visit Right Choice Auto Sales online at shoprightchoice.com to see more pictures of this vehicle, more information, and the free Carfax or call us at 954-933-3189 today with any questions or to purchase this vehicle. We also offer nationwide delivery to your home. Warranty Description: 3 month/ 3,000 mile nationwide warranty is valid at any mechanic shop in the country, zero deductible, 24-hour roadside assistance, and more. Warranties are available up to 4 years/ 48,000 miles at an additional cost. Please inquire for details. Please visit us at www.shoprightchoice.com for more details about our low prices. Offers cannot be combined. Price valid when originate from an internet advertisement and must present the ad. Dealer service/document fee of $300.00, tax and tag/registration fee and any finance charges are not included on quoted price. Internet Price subject to change without notice to correct errors or omissions or in the event of inventory fluctuations. Vehicle condition is consistent with its age and mileage and may include minor scratches, dings, and normal wear. Please contact us with any questions. We work very hard to provide our customers with the finest pre-owned vehicles available at the lowest possible prices in the country. We are very particular when it comes to the inventory we offer and only sell CLEAN TITLE (NO rebuilt, salvage, flood, TMU, etc.) vehicles that almost always have a clean Carfax (no accidents) as well. We inspect our vehicles thoroughly before offering them to you and we do comprehensive market research to be sure our deals are the best anywhere in the country. Our inventory is also in far better condition than the average car of the same year found elsewhere and typically has much lower mileage than the average for that model year. Our website provides 50+ photos of each vehicle, a free Carfax report, a condition report, a full description, vehicle options and features list, and in many cases a nationwide warranty. We are here to answer your questions before and after your purchase so feel free to contact us at any time. If you're looking for a quality vehicle at the right price, you'll find it at Right Choice Auto Sales so check out our inventory at www.shoprightchoice.com. You'll save time and money, guaranteed! We also can deliver any vehicle to your driveway no matter where you live. Through our large network of nationwide transporters we're able to have your car in your driveway very quickly and at wholesale cost. All we need is your zip code to give you a delivery quote so don't hesitate to inquire! Please read this Disclaimer carefully before using this Site. By use of this Site and submission of its forms, Customer agrees to Opt-In all Customer Non-Public Information(NPI) for its intended purpose. Use of this Site for any purpose signals assent to the terms and conditions set forth in this Disclaimer. If you do not agree to these terms, then please exit. This Site is licensed and operated by Right Choice Auto Sales located in 430 S Dixie Hwy West, Pompano Beach, FL 33060, which is an used automotive dealership operation or related dealership marketing entity consisting of the dealership(s), make(s), vehicle inventory and/or marketing content represented in this Site and its subsidiary Sites. The information within this Site is provided"as is". No warranty is expressed or implied to the fullest extent permissible by applicable law. Right Choice Auto Sales and any of its providers of information do not warrant error-free or uninterrupted service of this Site. Please note that this Site is operated in Pompano Beach, FL and therefore all Disclaimers are predicated on applicable Florida or country laws and standards. Visitors from outside Florida or country should be aware that Right Choice Auto Sales makes no representation that this Site and the information contained herein is appropriate or available for use in other areas. Those who enter this Site from outside Florida or the United States do so at their own initiative and are directly responsible for compliance with their local laws to the extent those laws apply. All vehicles are sold on an "as-is" basis unless stated otherwise. All prices plus sales tax, transportation, warranty, financing charges, and dealer fees where applicable. Prices and special offers are subject to change. Mileage listings are estimates and are not necessarily accurate odometer readings. Some vehicle information and vehicle pricing may be unintentionally missing or inaccurate, and Right Choice Auto Sales will endeavor to correct such discrepancies in a commercially reasonable manner upon customer notification of such errors or omissions, but pricing errors and listing errors are considered invalid and may or may not be honored at the sole discretion of Right Choice Auto Sales. Payment calculator should not be used for exact finance amounts determined WAC. Daily changes in inventory may result in the unavailability of certain vehicles listed on-line. A commercially reasonable effort will be made to keep the inventory database current on a multi-week basis.